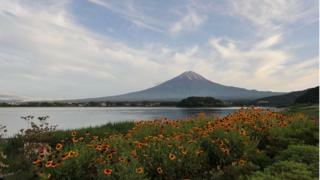 Japan is marking Mountain Day on Thursday, the latest addition to its extensive public holiday calendar. The extra day off - Japan now has 16 public holidays a year - became law in 2014 but is just taking effect. The campaign to have a Mountain Day was a longstanding cause for hiking and mountain-related groups, who wanted to celebrate Japan's terrain and its connection to the nation's geography and culture. Japan also likes to have something specific to celebrate on each public holiday, such as Greenery Day in May, Marine Day in July and Respect for the Aged Day in September, though most people treat them as just another day off. Because the kanji (Chinese characters used in written Japanese) for "eight", 八, looks a bit like the sides of a mountain. Also "11" looks a bit like two trees, say some. Many municipalities had also already designated the date as one to celebrate mountains and, unusually, there were no other public holidays in August. What's so Japanese about it? Japan's dramatic landscapes is scattered with volcanoes, earthquakes and hot springs, caused by the smashing of tectonic plates. The country's many peaks are more than just geographical features. They also explain Japan's densely packed cities - squeezed into the flat land near the sea, and, observers say, the culture that has arisen there. Despite this extreme urbanisation, many Japanese people see themselves as more in touch with nature than people in many other developed nations. So everyone will be going hiking? Not exactly. While hill-walking is popular, especially with senior citizens, an admittedly small survey by the Japan Weather Association found that nearly a third of those they asked had not even heard of the new holiday. Nearly 10% were thinking about a trip to the mountains though - not such a bad idea in the notorious heat of the cities in August. Those that do have been advised to go properly equipped and keep an eye on weather forecasts. Image caption The law says the new day off will provide "opportunities to become familiar with mountains"
Why so many public holidays? Japan now has more official days off than any other member of the Group of Eight (G8) world powers. It also has a problem with people working excessive hours and not claiming all the leave they are owed, which has been blamed for weak consumer demand - and even for Japan's low birth rate. It is hoped public holidays encourage people to take longer vacations - you only need to take a few days off to join them with weekends to get a proper break - and spend money in the process. The Japan Times suggests the new holiday will be responsible for a possible extra 820bn yen ($8bn; £6bn) in spending, including a jump in sales of camping gear. Any effect on the birth rate is less clear, though families are probably grateful for more time together.